The sales, financing, service and technical team at Capital Ford is excellent. After understanding exactly what we were looking for, they found us a used truck in our price range. They put it up on a hoist so that I could inspect it (fixed a seeping seal I found at no charge), and let me look at the computer scan after a test drive. I would definitely deal with them again and recommend them to anyone looking for a vehicle new or used. We highly recommend Ted Afanasiev at Capital Ford. He was so informative, patient, there to help us, not just out to make a sale. Meeting a likeable salesperson is a large part of the sale. Great staff throughout the building. Ian was very helpful and very accommodating in helping us find the perfect truck. Great experience there, would recommend to anyone interested in getting a new or used vehicle. Servicing was fast, efficient and professional. I took my Lincoln MKX in for an oil change and a bulb replacement in my front turn signal light to Mid-Town Ford instead of Capital Ford-Lincoln because they were closer. When I went to pay the bill, they told me they had done only the oil change and I would have to schedule another appointment for the bulb replacement because it would involve taking part of the front bumper apart. They gave me a written estimate for $150 labour plus the cost of the bulb. Since I didn't have my work schedule with me, I didn't make the appointment and promptly forgot about it (my wife drives the MKX more than I do). For the next oil change, my wife made an appointment at Capital Ford-Lincoln, so I asked her to find out about replacing the bulb there. Capital told her they could replace the bulb at the same time as the oil change and charged her $10 plus the cost of the bulb. That's not a typo- TEN DOLLARS instead of $150!! Would we go back to Mid-Town Ford for anything - NEVER! 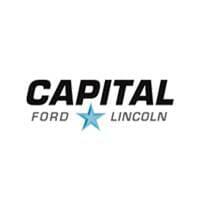 Kudos to Capital Ford-Lincoln- a dealership you can trust! Love the staff here! Just bought a new car from Mark Elliott and he is wonderful! So friendly, and charismatic. Even with us bringing our 1 year old with us and having to spend the better part of the day there, he brought out crayons and a colouring book and juice. Even called us a few days later to make sure everything was good for the first few days with the car. Service center was great and speedy. If youre ever looking for a vehicle, this is the place to go! Even sells things other than fords and Lincolns becausw we just bought a dodge charger. 10/10 would recommend!